You are currently browsing the tag archive for the ‘rock chick’ tag. I love the way this girl mix and matches, so many unique elements, all working sublimely together. The bowler hat, the tulle tutu like skirt, the fur/skin scarf, all the ethnic necklaces and bangles and of course the doc martens! Each element is so different from the other, yet everything blends into 1 unified vision on her. Hah! One day I’d like to learn how to do that. 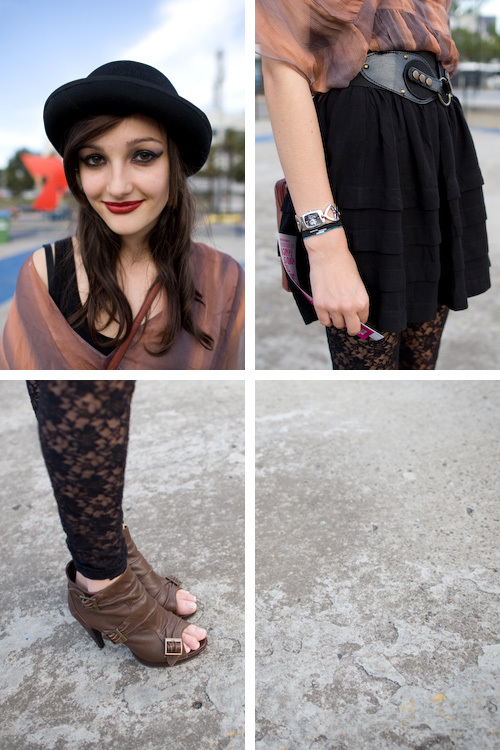 Describe your style: Try to be myself, try not to dress like anyone else, be comfortable and express myself creatively. Favourite fashion designers: Gareth Pugh, Martin Margiela, Karl Lagerfeld, John Paul Gaultier. I apologise for my lack of posts, I’ve been swallowed up into the black hole that is a 9 – 6.30 job, escape is near! RAFW aka Sydney fashion week is also near! How exciting, with appearances by Susie Bubble, Tommy Ton, Scott Schuman, Garance Dore and a small army of Aussie bloggers, it’s going to be fun. That is if they decide to approve of my media accreditation application and if I don’t break my ankles, yeah, it’s always nice to have one’s ankles intact. Now onto some more from LMFF! Describe your style: Dressed up grunge. Favourite fashion labels: Balmain, Steve Madden. Favourite clothing stores: Bardot, Sportsgirl.